Police are warning cab drivers of a rash of robberies in Chicago's West Garfield Park neighborhood. CHICAGO (WLS) -- Police are warning cab drivers of a rash of robberies in Chicago's West Garfield Park neighborhood. A community alert said thieves threatened taxi drivers and took their cell phones, wallets and cash. One robber showed a knife. There were three separate incidents. One driver was robbed in the 300-block of South Kilbourn Avenue around 7:55 p.m. last Saturday. Another driver was robbed in the 300-block of North Karlov Avenue around 11:10 p.m. the same night. 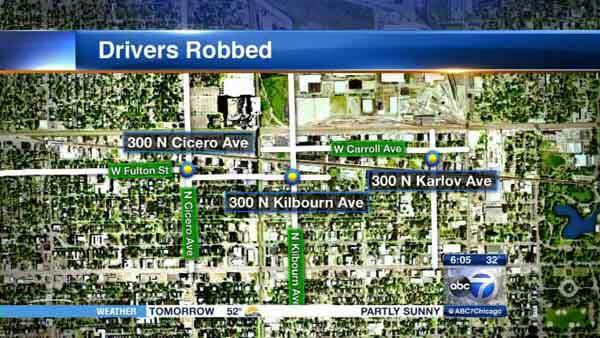 A third driver was robbed in the 300-block of North Cicero Avenue around 7:40 p.m. two days later. Police are looking for three different men.